While awareness of gut health – that is to say, the well-being of your digestive tract – is slowly tiptoeing into the natural health spotlight, taking good care of the indigenous micro-flora that live in your intestinal tract is quite possibly the single most important and impactful thing you can do for your body. Unfortunately, in our modern society full of chemicals, processed foods, and anti-biotic / anti-bacterial everything; it’s so easy to disrupt the delicate balance of our internal microscopic symbionts that the majority of people unknowingly suffer from poor gut health. I say “unknowingly” because the symptoms of this very common illness are more often than not attributed to other diseases or disorders (ie: IBS, ADHD, depression, auto-immune problems, chronic fatigue, eczema, etc. The list goes on and on!) Sadly, if your gut health is lacking, no treatment for any of these other problems is going to help much – not permanently, at least. Don’t despair, dear friends! While the road to better gut health isn’t always easy and there are many steps involved, it is possible to do it using all natural solutions. Cutting back on sugar and processed foods, finding natural alternatives to antibiotic treatments, and detoxifying your organs are a few of the big ones; but if you want a good starting point, go with naturally probiotic foods. The term ‘probiotic foods’ is generally used to refer to those containing natural living strains of healthy bacteria (or occasionally yeast) as a result of the fermentation process. While a plethora of probiotic foods exist, as with anything in the natural health world some are much better for you than others and not every one of them will benefit every person in the exact same way. Keeping these ideas in mind, we’ve chosen a dozen naturally probiotic foods from both vegan and dairy sources which we feel are the best; 12 foods with not only probiotic qualities but also fiber, protein, vitamins and minerals to nourish your whole body from the inside- (of the gut) out. Gouda, Provalone, Gruyere, and Cheddar are just a few of the varieties of cheese which are ripened and aged by anaerobic Lactobacilli or “good” bacteria. These foods are ideal to carry live cultures because the nature of the cheese acts as a protectant against acid in the stomach which kills most beneficial microbes before they can reach the habitable environment of the small intestine. In addition to being probiotic, cheese also provides the body with calcium and protein, both of which can aid with weight-loss (contrary to popular belief) by improving digestion and stabilizing metabolism, respectively. Just take care to moderate your intake as cheese is also highly caloric! Another lacto-fermented dairy product, buttermilk is incredibly healthy. Because the lactose protein in buttermilk has already been converted into lactic acid by our beneficial bacteria, this drink is safe for lactose-intolerant individuals. It is also low in fat and calories, but packed with vitamin B12, riboflavin, calcium, potassium, and protein. Due to its impressive nutritional roster, buttermilk is great for easing an acid stomach, improving digestion, and boosting energy levels. You’re probably already familiar with the many health benefits of fish oil, however fermented cod liver oil is a whole different experience. This is one of the oldest “super foods” on the market. It dates back thousands of years and was used by many different cultures. Fermented cod liver oil is not only chock full of probiotics, it also supplies a massive amount of vitamin D – a nutrient in which an alarming number of people are lacking due to our tendency to avoid sun exposure. Fermented cod liver oil also packs a mighty punch of vitamin A, which (no matter what you’ve read recently) is great for your skin and eye health, as well as for cellular regeneration. I highly recommend trying Green Pastures’ cold-pressed all-natural Fermented Cod Liver Oil. It is the best you can get. Find it in capsule form here or in traditional oil form here. Assuming that the idea of eating the fermented oil from a fish liver just isn’t your thing, try Kefir instead. Another excellent source of probiotics, as well as vitamins A and D, this slightly effervescent milk-based beverage is very similar to yogurt in flavor. Like yogurt and other cultured dairy products, Kefir also provides a boost of nourishing calcium, vitamin B12, and protein. You can find Kefir in just about any natural health food store. Read more about the health benefits of this natural probiotic food in 12 Things You Should Know About Kefir from the Huffington Post! “The new drink with the funny name” as someone once described it to me, Kombucha isn’t really new. In fact Kombucha dates back at least a couple thousand years, but it is only recently beginning to hit the shelves of big name grocery stores in some parts of the world. Modern scientists will tell you that there is no scientific evidence to support our claims that this fermented sweet tea beverage will improve your health. We natural living enthusiasts counter that with logical evidence. People around the world have been drinking probiotic Kombucha to improve their health for over two millennia and it works. Learn more about the health benefits of Kombucha here. Also, you can order Organic Kombucha from this page on Amazon. From personal experiences with other cultures, I’ve picked up a lot of healthy eating habits. Time spent in Japan, for example, imparted upon me a deep appreciation of fresh-caught Pacific seafood. It also introduced me to the culinary perfection of miso soup. While they aren’t the only types available, red and white miso are the most common. To make a delicious Miso soup, I prefer a combination of both (more white than red, though I’ve never measured them out and always whisk them together by sight, smell, and taste.) I recommend experimenting with the amounts until you get it just right for you. Also, you can add shiitake mushrooms to your soup for even more flavor, texture, and health benefits! Originating in Korea, the history of kimchi – a fermentation method involving the use of salt and other spices to preserve vegetables such as beans, radishes, and cabbage for consumption during the country’s long, cold winters – dates back around two thousand years. While the creation of kimchi was a necessity before the advent of modern food preservation technology, in modern societies these traditional dishes have endured, even becoming a point of pride among many Korean families. As such, the individual blends of spices used to make kimchi are often closely-guarded secrets passed down from generation to generation. 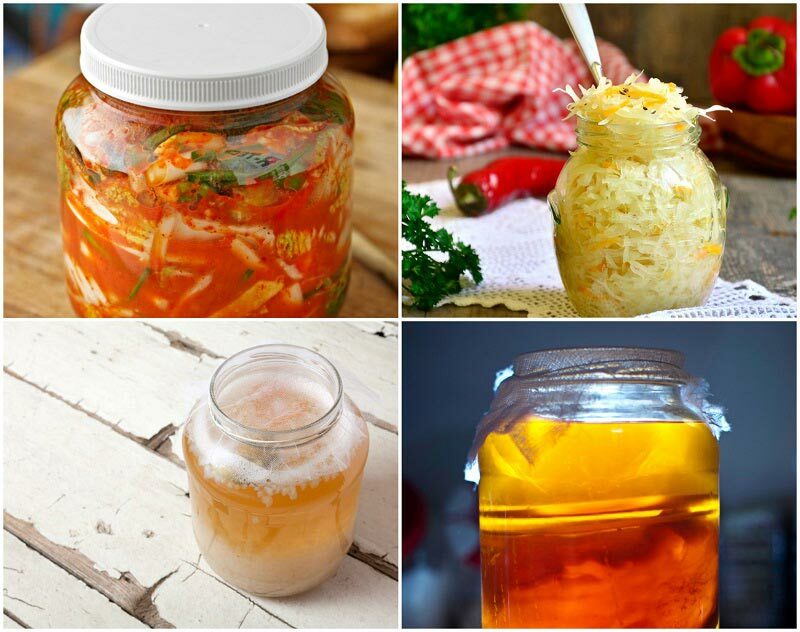 Despite the countless variations on this traditional Korean staple, all forms of kimchi have one thing in common: they are all incredibly healthy probiotic foods. Depending on the vegetables included in kimchi (cabbage is the most popular) kimchi may also contain large amounts of protein, vitamins, and minerals in addition to being naturally probiotic. Another dish of fermented cabbage, sauerkraut originated in Germany then quickly spread throughout other parts of the world. Packed with vitamins, minerals, and antioxidant, in addition to its probiotic qualities, sauerkraut makes a delicious and healthy accompaniment to pork and poultry dishes. Just be sure to choose a raw sauerkraut as many commercially-available products have been heated to extend their shelf-life, a process which destroys most (if not all) of the healthy bacteria contained in the kraut. Not to be confused with that jar of commercially-produced, vinegar-soaked gherkins on the supermarket shelf, natural pickles are cucumbers (or other veggies) which have been fermented in brine using their own naturally-occurring populations of Lactobacillus bacteria. While the process of making natural pickles is complex and time-consuming, the first time you bite into a “real” sour pickle, you’ll know it was worth it. For more information as well as a detailed recipe for making them, check out wildfermentation.com. High up in the mountains of North Carolina lies the city of Asheville, one of the best places to sample fresh organic foods on the east coast of the United States. My first experience with tempeh happened there – about fifteen years ago, before this naturally probiotic food had the gained the popularity it enjoys today – at the famous Mellow Mushroom pizzeria. It was listed as an available topping and, having never heard of tempeh before, I decided to try it. It was delicious! Packed full of protein, vitamins, and minerals; tempeh is a fermented soy product which offers many of the same benefits of tofu, but in greater quantity with far better flavor and texture. Enjoy tempeh in salads, sandwiches, or any other food as a tastier and healthier alternative to meat. Even if you aren’t a fan of soy, this is one probiotic food that just might surprise you! Praise for apple cider vinegar is being sung with gusto all around the world and in every natural health nook and cranny on the internet. While the health benefits of this incredible “super food” have become fairly common knowledge, what you may not know is that raw, unfiltered apple cider vinegar is also a natural probiotic. Use raw ACV to add flavor to salads and other veggies, sprinkle it over snacks like popcorn, or add it to beverages like tomato juice and tea for a powerful full-body health boost! Last but definitely not least is the natural probiotic that is the most popular and well-known: Yogurt. This lacto-fermented dairy product has been around for almost as long as humans discovered the domestication of livestock (think Neolithic, or around 10,000 BC!) While it is most often made from cow’s milk, yogurt may be created from buffalo, sheep, goat, horse, yak, or even camel milk depending on what part of the world you’re in. While the fermentation process of yogurt is performed by only two specific anaerobic bacteria strains, additional live cultures are often added for their probiotic benefits. However, be aware that not all yogurts in your local supermarket contain these healthy bacteria. When in doubt, always read the label!